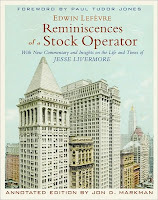 At the age of 14, Livermore got a job in a brokerage office updating the quotation board. The latest quotes would be shouted at him, and for hours on end (as long as the market was open) he would change the numbers on the board. Since arithmetic came easy to him and he could remember numbers easily, Livermore eventually started to notice patterns in the quotes he would receive. He would start to make notes in a little book predicting market movements (based on the movements of their past prices) and then later check to see if he turned out to be right. He figured he was doing quite well, so he started to put his own money to work in bucket shops throughout his area. Livermore made so much money off of the bucket shops that one by one they refused to deal with him anymore. He wouldn't win on every trade, but figures he made money about 6/10 times, and that it would have been 7/10 times, but for the fact that he would sometimes deviate from his method for psychological reasons. Not long after, he became famous around the country as "Boy Trader", and bucket shops were wise to him. As a result, he was forced into trading at legitimate brokers if he wanted to trade, and so he showed up in NYC in 1898 at the age of 21 with $2,500 ($70,000 in today's dollars) he had accumulated so far through bucket shop winnings. Unfortunately, over a period of six months he lost it all and then some in stock speculation through legitimate brokers, due to some key differences between real trading and bucket shop operations. In real trading, you never knew the market price you were getting by the time your trade got to the floor. You might want to short something at $108 for example, but by the time your trade transacted the price might be $102, and you've lost your gains. Since the bucket shops were closed to him now, Livermore had to figure out how to make money with the new playing rules he had now encountered. Quite entertaining! Thanks for the recommendation, Ankit!